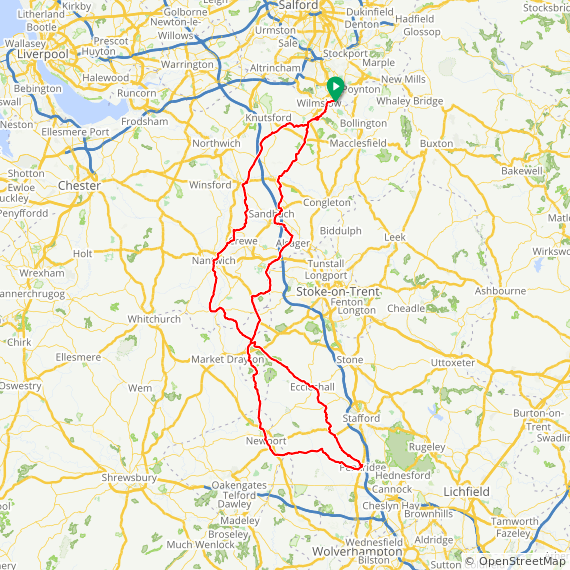 A revised route for 2019, with a new control at Penkridge allowing greater flexibility of ride times and taking out that short stretch of the busy A49. The permanent version of the calendar event, which is normally run in January/February so here's a chance to ride it in decent weather. From Dean Row (near Stockport), the route takes you past excellent cafes at Radway Green, Newport and Audlem. No big climbing and lots of pleasant lanes in Cheshire and Staffordshire. The former controls at Wheaton Aston and Wrenbury had restricted opening hours, so replacing these with a new control at Penkridge means that you now have greater flexibility about where and when you start this Perm. Just pick a good day. Riders with an old unused Brevet Card can choose whether to ride the old route, or to amend their Brevet Cards to reflect the new Control Locations.